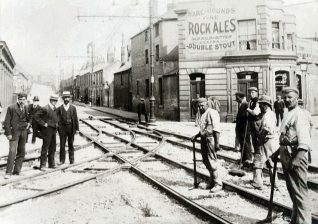 Schemes for tramways were suggested in Brighton in as early as 1864, but the corporation’s electric tramways system did not begin operating until 1901. 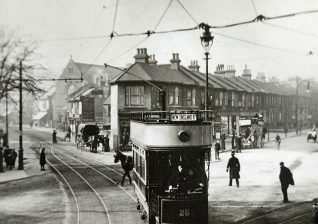 The Mayor of Brighton, Councillor John Stafford, drove the first tram on the 25th November, 1901. His route was from Victoria Gardens, along Lewes Road and terminated at Preston Barracks. A ride on the trams cost the grand sum of 1d for any distance travelled on the 9.5 mile system. Click on the photographs below to open a large version in a new window. 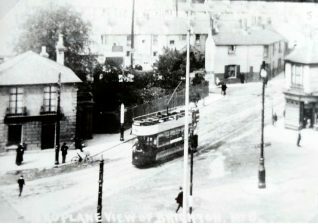 The trams were very popular, but by the 1930s the failings of the tramways system made the corporation consider the necessity of a new travel system for the town. The result was a new network of trolley and motor buses, which were better able to serve the new suburban developments. 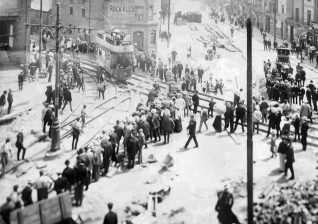 The last tram ran from Upper Rock Gardens to the Old Steine on September 1st 1939; the trams had done almost thirty eight years of sterling service to the town and their demise was mourned by many. It is so enthralling to see photos of places that made such an impact on my young life. I can still recognise the road structures even though it was well before my time. The scenes must have been the views that my father had when he was a lad being born in Brighton in Queen Victoria’s reign and growing up in the Edwardian era. Just really interesting for me. My thanks go to Jennifer Drury for this lovely piece. The James Gray collection is a wonderful archive that is priceless to the people of Brighton and anybody else with an interest in Brighton. Thanks for your comments Mick. It is nice words like yours that make my volunteer job worthwhile. I will never look at these photos without thinking of your dear old dad. As part of our Centenary of the St John Ambulance at Brighton, I am looking for more information about the first Commandant, Charles George Yates, who was active as a Councillor and on the board of the Brighton Tramways, as well as being a pharmacist in Brighton. He died in July 1938 and a newspaper article on his funeral mentions his work. As we are negotiating to get his name on one of Brighton’s new buses, would there be any details of his work? David Shelton, Unit Manager, Southwick Unit St John Ambulance. Do you remember the 46?